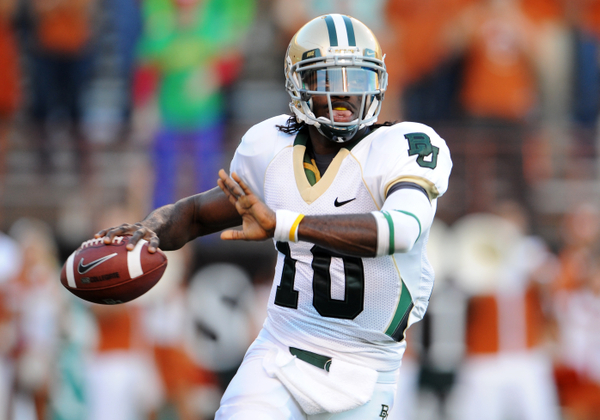 Could RG3 be the answer for the Browns at QB in 2012? Another NFL season has ended and once again my beloved Cleveland Browns are on the outside looking in at the playoffs. This offseason though the glass they’ll be looking through is smeared with question marks and big decisions. Going into the 2011 season everyone knew that the season hinged on the growth of quarterback Colt McCoy and if he could take the next step in his development as the leader of the team. After 13 games under center, McCoy was leveled by James Harrison and suffered what turned out to be a season ending concussion. His inability to come back for the final 3 games only raised more questions about his ability to play in the physical AFC North. Add the injuries to Peyton Hillis and arguably the worst receiving corp in the entire NFL and you get the most abysmal display of offense Browns fans have seen since their return to Cleveland in ’99. So where do the Browns go from here? Many already are calling for the “McCoy experiment” to end and for the Browns to draft Baylor QB Robert Griffin III with the 4th pick in the draft. Others are hoping GM Tom Heckert signs Matt Flynn so that he’d be the signal caller going forward. Still others think McCoy wasn’t given enough weapons to fully see what he is capable of and should be given another year. One thing is for certain though- the future of the Browns hinges on the next 3 months that lead up to the draft in April and what the Browns decide to do about the quarterback position. A question the Browns haven’t been able to answer since Bernie Kosar last laced them up and played along the lakefront.